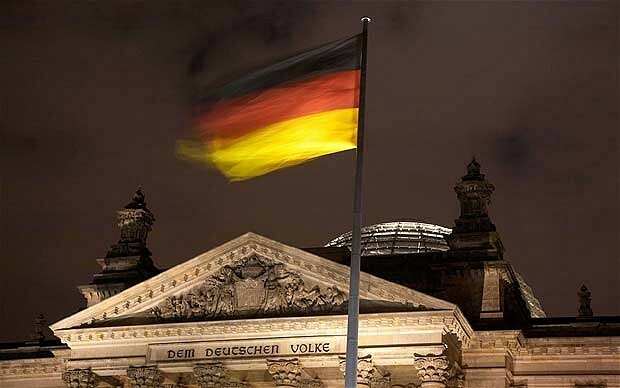 ‘Succulture’ (Germany) chose ‘Love InshAllah’ as its first foreign-language book review! Check out some recent feedback from our readers. Let us know what you think of the book too — follow us on Twitter @LoveInshAllah! Love InshAllah on Al-Hurra TV! Sometimes a book can weave its way into your consciousness so deeply that the characters and stories merge with you, mirroring back buried pieces of you, and expand your thinking in unimaginable ways. Love, InshAllah: The Secret Love Lives of American Muslim Women, edited by Nura Maznavi and Ayesha Mattu, is one such book. 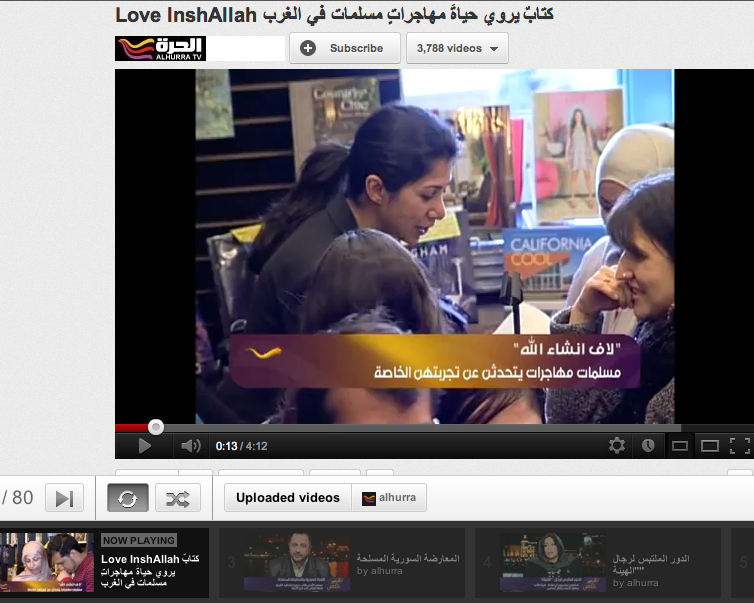 Al-Hurra TV (based in Dubai) ran a lively Arabic video feature on the book and our reading at LA’s Book Soup. Orange County’s The Daily Pilot writer Mona Shadi wrote a feature too. Deonna Kelli Sayed (‘Even Muslim girls get the blues’) had a fascinating interview with NPR on her Love InshAllah story + her book Paranormal Obsession. Leila Khan (‘Rerouting’) was interviewed by KPFA’s awesome APEX Express, which highlights Asian & Pacific Islander perspectives. Her insights begin at the 36-minute mark, here. Community organizer and contributing writer Tanzila ‘Taz’ Ahmed (‘Punk drunk love’) was selected as Asian Pacific Americans for Progress (APAP) 2011 Unsung Hero. Taz gives us ways to ‘pay it forward‘ at her blog. For those of you in Boston, our contributor Zahra Noorbaksh (‘The Birds, the bees – and my hole”) will be performing her hilarious one-woman show ‘All Atheists are Muslim’ at Boston University tomorrow night! Filmmaker and contributor Nijla Mumin’s new film Two Bodies was featured in two recent film festivals. You can catch the trailer, here. And, finally, Our Other Sisters interviewed Zahra, and Where the Girls Go featured contributor Najva Sol (‘The first time’). Wow – what an incredible couple of days! Feeling the love from Boston & NYC and media outlets all over the nation! Since last week, Love InshAllah has been featured in the Huffington Post (twice! ), Washington Post, Christian Science Monitor, San Francisco Chronicle, Boston Herald (including their Valentine’s Day gift guide), Times of India, DC’s Metro Express, and Travel + Leisure. 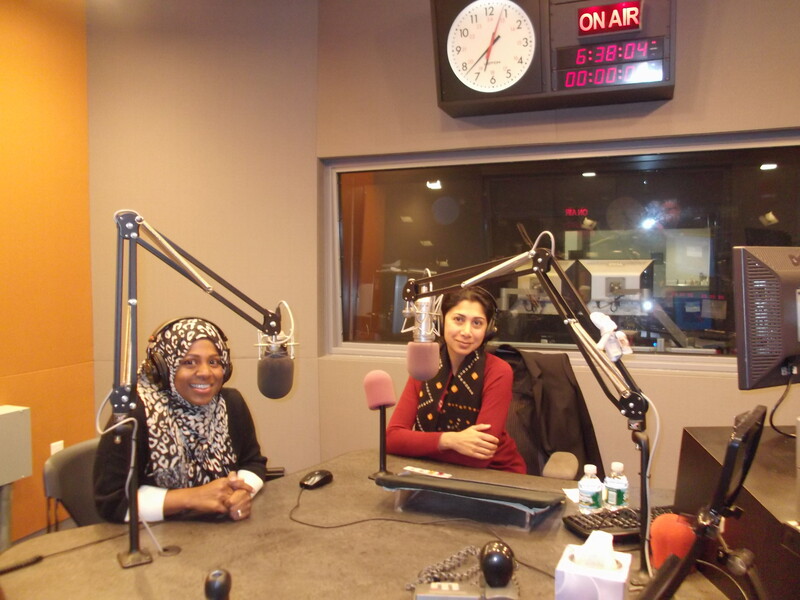 Editors Ayesha & Nura have also been busy on the radio talk show circuit with a segment on NPR’s The Takeaway, a full-hour on the NPR show Here on Earth: Radio Without Borders, a podcast with the Center for American Progress, and a webcast with the South Asian Journalists Association. Contributor Asiila Imani’s piece was excerpted on Inside Islam, a program of Wisconsin Public Radio. And, editors Ayesha & Nura, also penned a couple of pieces for both Altmuslimah and cnn.com’s belief blog. Arts, culture and politics journal The Brooklyn Rail reviews Love, InshAllah: “…the stories transcend stereotypical conceptions with humor and heartbreak; which is to say, with humanity. Whether introducing Catholic beaus to immigrant parents or cyber-eloping as an Islam-convert in a post-9/11 America, the collection does not unveil repressed, obedient girls, but willful women whose search for love is at once complex and joyful.” Read more, here.